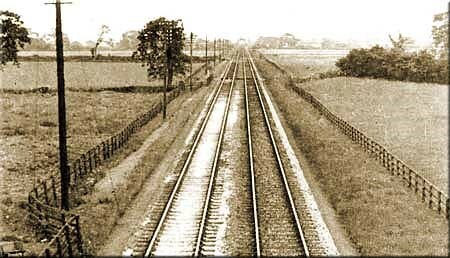 Home › History › A Railway Station for Bishopthorpe? A Railway Station for Bishopthorpe? It’s OK – you haven’t missed anything – there are no plans to build a railway station at Bishopthorpe! It’s just that recently, a Bish-dot-net reader asked if a station or goods yard had ever been built near the nurseries on Appleton Road. Taking a look at the old Ordnance Survey maps of the area soon established that no railway station was ever built at Bishopthorpe – but it wasn’t for the want of trying! The North East Railway slicing through the Bishopthorpe fields. May Hill took this photograph in the 1930s looking south-east from Bishopthorpe Bridge to Naburn Swing Bridge, which can just be seen in the distance. On the 2nd January 1871, the North East Railway Company opened its York to Doncaster branch, providing a new link on the East Coast route to Scotland. This shortened the distance between London and York by about three miles. Since the line sliced through the fields on the edge of Bishopthorpe, the provision for a local station was obviously discussed, but rejected. According to an article in the Yorkshire Evening Press of 1907, the “station question” had exercised the minds of villagers on several occasions. Apparently, Dr. Thomson, who was Archbishop when the line was built, had frowned on such a scheme. No doubt he did not wish to encourage even more tourists to visit his peaceful home parish than those who already travelled here by foot, horse or steamer to view the ancient palace of the Archbishops of York. However, with the arrival of the twentieth century, a different man of influence brought his feelings to bear. In 1902, Mr. Arthur Toward Watson, a wealthy coal owner from County Durham, came to live in the village. He employed the fashionable York architect Walter Brierley to build a splendid house, known as The Garth, on Sim Balk Lane. Mr. Watson who, at one time was chairman of the Parish Council, travelled daily to Newcastle on business. He was described by his son, John, as “a man of unlimited energy” which is not surprising as he cycled to York Station every weekday morning to catch the 9.30 a.m. train and returned at 7.30 p.m.
Mr. Watson, who understandably must have tired of the journey, gained the support of the village in his quest for a railway station at Bishopthorpe. In 1905, he and his wife were joined by the vicar, Rev. Pennyman, and farmer Mr. Lofthouse, when they presented a petition at the headquarters of the North Eastern Railway in York. Apparently, the petition had been signed by every householder in the village with the exception of four. Despite this popular appeal, it held no sway with the directors of the railway company. Fifteen years later, Bishopthorpe Parish Council supported the local farmers and market gardeners by making a formal application to the N.E.R. board for a station and siding but, once again, this was turned down. The plentiful gooseberries, peas, and potatoes that were grown in the area therefore continued to be transported to market by horse and cart. After 1920, the idea seems to have been dropped but, if the N.E.R. had agreed to build a railway station all those years ago, no doubt it would have been closed in the 1950s for economic reasons, just like the stations at Naburn and Copmanthorpe. If it hadn’t been made redundant then, it would have certainly disappeared with the opening of the Selby Diversion in September 1983. But that’s another story. Yorkshire Evening Press: 19 April 1907, p2. Lest We Forget, C. E. W. Brayley (1975), p31. Bishopthorpe Parish Council Minutes: 4 January 1920.